ROAD TOWN, Tortola, VI- National star athlete Kyron A. McMaster not only destroyed a quality field on his way to a world leading time in the 400m Hurdles at the Jamaica Invitational on May 20, 2017 but felt he actually ran a faster time than what was given to him. “After I finished the race the commentator said 47.79. They robbed me of a point second which would have gotten me the meet record, yes, they changed it to 47.8,” the 20 year old Virgin Islander said. McMaster was at the time addressing the large gathering of persons who had converged at the Breeze Way, Central Administration Complex, for an appreciation ceremony in his honour on Monday May 22, 2017. 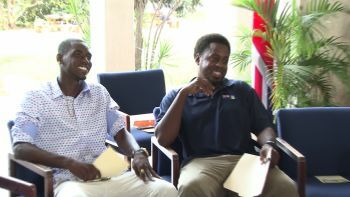 He also noted that his coach Dag Samuel had predicted the time he was going to run in that particular race. The local boy, who is now getting all the attention from all and sundry after his major accomplishment, alluded to the lack of major sponsorship on his behalf. He said he brought it to the attention of his coach that most of the other athletes from other countries were decked out in their brands of Nike, Jordan among others and he, the "BVI boy", was dressed in Crocs. He said his coach's response was, “If you handle business in Jamaica like we come to, that is going to change eventually." Having stunned the field, that change is on the horizon as it is confirmed that Usain St Leo Bolt's manager is currently in negotiations with McMaster’s agent. I appreciate this young man for his continued acknowledgment and praise for the people in his support system. At his age, he already understands that it takes a team who sacrifice their time and energy towards making him the greatest potential of himself, and more to come. Kudos to you young man. You will indeed go far. Continue to encourage your young admirers to dig deep within themselves and manifest their own inert gifts/stars within themselves. We all have our own stardom on this earth, but it takes a support system who genuinely cares for the success of our youths. Stay focused! The standing analysis is, however, reasonable. You have done well and made us very proud. Congratulations the sky is the limit this is a taste of what you can achieve. Keep pressing on you can make it happen, hard work pays off. First thing. I agree the Rob you, However. Now let that motivate you, work on beating that time. Leave no doubt... Second thing. B Humble, stay level headed, stay focus, stay away from the girls, stay away from the media.. Let your coach be your voice and your rep..Third thing.. Hussain Bolt Manager is good for you, make it happen... Forth thing. Stay away from the Americans, see them as your enemy because they are. You are going places, keep it up and do not forget the God who is helping you. God bless you. See, your crocs crossed the line first. Everything in Gods time youngin. You will share from your saucer when your cup overflows. B'lee dat! Good job but do not start with the negative. In track meets worldwide time are adjusted after races for wind speed, direction etc. Be humble and accept the world leading. Your next race will say who you are. Also your time will come to get sponsorship based on what you do going forward.